Our adventure with the Masters of Foxhounds Association’s Hark Forward Western Tour has entered its fourth week. After our steep hunt with Red Rock Hounds in their home fixture in Reno, Nevada, we had a great catered meal from one of the Red Rock Hounds members. Grosvenor Merle-Smith introduced the 40 or so people eating dinner to the Tennessee Valley Hunt’s tradition of singing “Drink Puppy Drink” (penned by G.J. Whyte-Melville in 1874). Gro and his wife Rosie and I were joint-masters together for Tennessee Valley, and we loved to sing that old song every chance we got. The Red Rock members were shouting the chorus by the end! After two very long days hauling from Reno, with a layover in Wyoming and crossing over two time zones, we finally arrived in Burwell, Nebraska, on Tuesday, April 10. 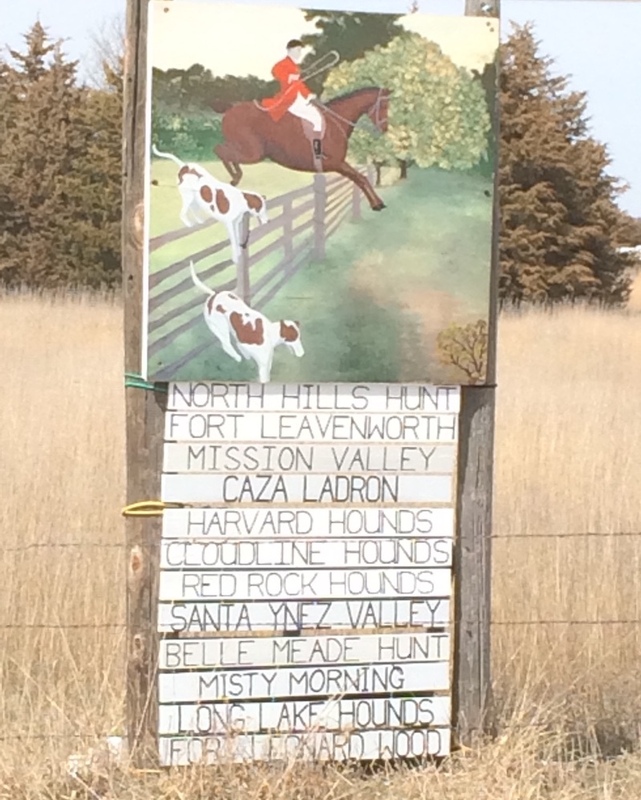 North Hills Hunt has been hunting Burwell once or twice a season for 25 years. The country is open, sandy grasslands with rolling hills and a few juniper trees. And just because it’s April doesn’t mean that Burwell got the memo about warmer weather. Wowzer. You know that old movie from the 1960s, “If It’s Tuesday, This Must Be Belgium”? Well, it was a Tuesday, but Burwell was introducing us to Nebraska with a sucker punch. North Hills and Red Rock Hounds combined a pack of 26 couple of hounds to hunt in Burwell, Neb. All photos by Gretchen Pelham. A howling wind that barreled snow sideways resulted in a wind chill in the single digits. And all the outdoor stalls and turnout at the Nebraska Big Rodeo grounds were without a wind break. My eyelashes froze together. My southern self was not happy. My poor Phillip was giving me the evil eye as I bundled him in every blanket I brought. Phillip is a 20-year-old Amish-bred large pony that we think is a Morgan-Standardbred cross. He has held up great with this grueling, traveling-circus schedule. His legs are still tight and clean, and he hasn’t lost his appetite or thirst. He has, however, become incredibly herd-bound to the three mares that are his trailering companions. That’s been the only burr on this trip with regards to him. The sign outside of the North Hills Burwell fixture. The morning of the first hunt day in Burwell the weather had decided to warm up dramatically. It was a balmy 30 degrees with no wind at the start. The footing was nice with a few holes, except on the farm road where it was hard packed and slick. The Flint Hills are rolling, grassy hills with few trees here and there. It’s good galloping country. The combined pack was cast into those rolling hills and hit on a coyote within the first 20 minutes. I just missed the view. Hounds ran that coyote in a such a straight line that the pack went 2 miles out of country before they were stopped. As Angela said: “Don’t measure the hunt by how many miles the pack traveled, but by the quality of the hunting while they traveled!” It was a great first day for the Burwell hunt week. My personal circus, the Hark Forward group, packed up again and headed west into yet another state and time zone: Colorado. The Arapahoe Hound Trials, the 13th and last hound trial of the season, were that weekend. I have discovered a new definition of “road founder”: You don’t know what day of the month it is, don’t know what day of the week it is, don’t know what time zone you are in and, most disturbingly, don’t know in which state you last showered. I haven’t read the news, watched television or seen a presidential tweet in about three weeks. It’s a wonderful but delirious state in which to reside that totally suits the free-thinking state of Colorado. Not sure I would recommend it for the long term, however. As we traveled higher in elevation in Colorado, I fell more and more to the traveling chest cold/flu that has been leapfrogging my group. I couldn’t ride the first day of the hound trials, so I went with Gro in his electric Polaris ATV. 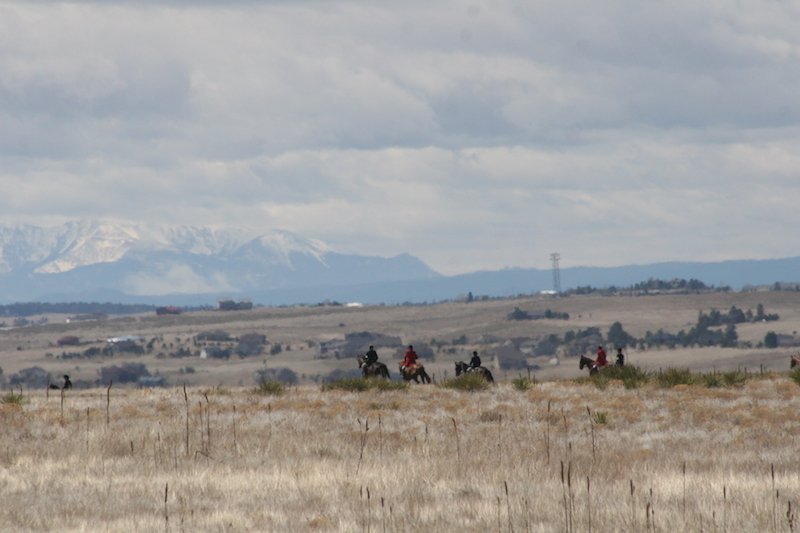 The Arapahoe Hound Trials in Colorado, with the Rocky Mountains in the background. Grand Canyon Hounds, Tejon Hounds, Bijou Springs Hunt and Juan Tomas Hounds each competed in the hound trials with the Arapahoe huntsman, Steve Currey, hunting the combined pack. Unfortunately, due to all the hot wire in the front range lands at the base of the Rocky Mountains, Gro and I could not leave the roads with the Polaris. So while we saw lots of coyotes that day, we didn’t see much of the hunt. By the next day I thought I was going to need a double lung transplant. I completely missed the second day of hunting as I was tethered to the bed. If I had been able to ride, then I would have enjoyed more than 170 new coops that have been built in Arapahoe hunt country in the last couple of years. Grand Canyon, by the way, won the hound trials. So the day after the hound trials we packed up and headed to our last destination—Miles City, Montana! This was a change from our planned stop in Bridlespur, Missouri. Red Rock Hounds had left Nebraska to go hunt with Big Sky Hounds in Miles City, so we decided to join them for a few days. Because Missouri is so close to Montana. Well, they do at least start with the same letter. Our stop in Colorado had marked almost 7,000 miles of travel. And we still have almost a week to go. What time is it again? Wait, is that smell me or my unlaundered, still-being-worn clothes from a week ago? Gretchen Pelham has joined the MFHA’s Hark Forward Western Tour for a once-in-a-lifetime trip across the western United States. About a dozen hunt members from all over the southeast converged at Belle Meade Hunt in Georgia to begin a month-long caravan that will cover about 10,000 miles and travel to Mission Valley Hunt Club in Kansas, Caza Ladron and Juan Tomas Hounds in New Mexico, Grand Canyon Hounds in Arizona, Tejon Hounds and Santa Ynez Valley Hounds in California, Red Rock Hounds in Nevada, North Hills Hunt in Nebraska, Arapahoe Hunt in Colorado, and finally, Red Rock Hounds in Montana. The Hark Forward initiative consists of friendly competitions and events nationwide to connect foxhunters, celebrate all aspects of the sport, and to raise funds for the renovations of the MFHA’s new national headquarters in Middleburg, Virginia. You can read previous installments here.